McGUFFIE, Serjeant, LOUIS, V C, 240693. 1st/5th Bn. King's Own Scottish Borderers. 4th October 1918. Age 24. McGUFFIE, Serjeant, LOUIS, V C, 240693. 1st/5th Bn. King's Own Scottish Borderers. 4th October 1918. Age 24. Son of Mrs. Catherine McGuffie, of 1, North Main St., Wigtown, Wigtownshire. 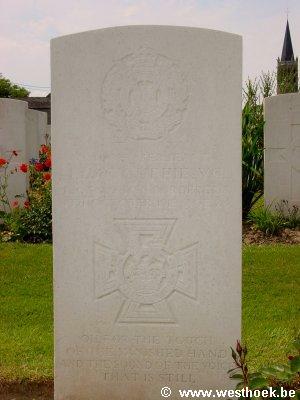 Zantvoorde British Cemetery I. D. 12. An extract from "The London Gazette," dated 13th Dec., 1918, records the following:-"For most conspicuous bravery and resourceful leadership under heavy fire near Wytschaete on 28th September, 1918. During the advance to Piccadilly Farm, he, single-handed, entered several enemy dugouts and took many prisoners, and during subsequent operations dealt similarly with dugout after dugout, forcing one officer and twenty-five other ranks to surrender. During the consolidation of the first objective he pursued and brought back several of the enemy who were slipping away, and he was also instrumental in rescuing some British soldiers who were being led off as prisoners. Later in the day, when in command of a platoon, he led it with the utmost dash and resource, capturing many prisoners. This very gallant soldier was subsequently killed by a shell.